It’s raining and cold today. I am cold natured for sure, but today I sit here at the counter in the shop in a long-sleeved shirt, a linen sweater, and a thick fleece jacket. Crazy! Just a few days ago we were all whining because it was hot and muggy. I wonder how long this weather will persist. Whatever. It sure is keeping visitors away from Cherry Street, though. If you read this today and can come to the shop, I’ll open this nice chilled white wine I have in the fridge. I have quite a few wonderful new items in the shop. First, I had bought a very interesting chair last winter. I loved the lines of the chair (very deco), but the upholstery was awful. I found some buttery moss green leather at Foam and Fabric, and took both to an excellent upholstery shop in Leicester. I am so pleased with the results. The size is great. It’s not too big, but it is still extremely comfortable. Another find is a full-sized Victorian rattan baby pram. It is in excellent condition. I saw it at a local antiques auction and fell in love with it. It was paired with an old lace parasol that fit into a holder at the back, but it was in such bad shape I didn’t bid on it. I like it better without, anyway. I got a new shipment of George Averbach’s fabulous glasses this week. The color palate is exquisite. 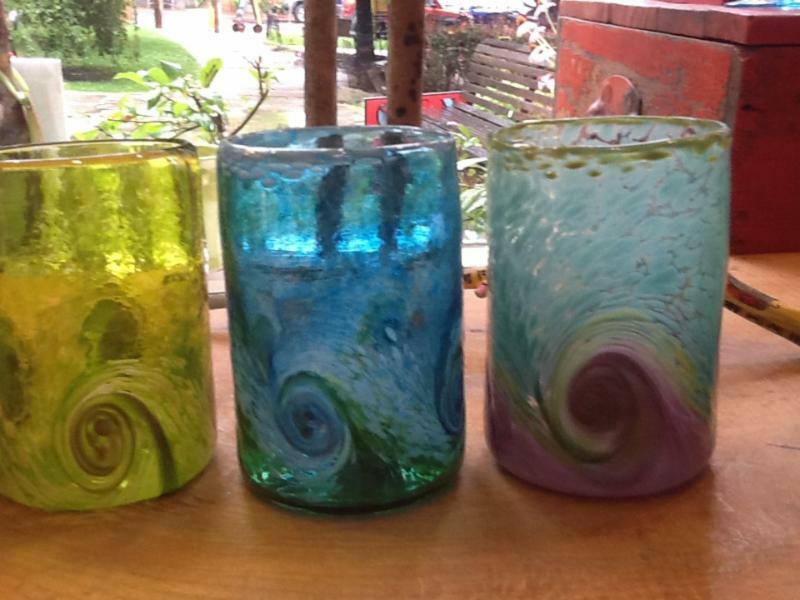 I have a very nice array of these rugged, hand-blown tumblers in the shop. If you have been wanting to see some new colors from George, please stop by soon, as these sell quickly. At the same auction where I found the pram, I bought a fine trio of equestrian prints. I stole them! So if you like horses come get all three of these long narrow old prints. You have until July 27 to catch this divine musical at NC Stage in Asheville. We went last night and had a ball. The acting is so good, and the score is amazing. Those of you from Charlotte probably remember Gina Stewart of Doubting Thomas. She appears in the show and also composed the score. Bring the whole family. Denise Wilson is reconfiguring my website so I can write the blog on it and have it available for people not on my mailing list. It is looking great and is almost ready. I’ll let you know. Please come by the shop when you are in downtown Black Mountain. Now I also have a booth at Sleepy Poet Antique Mall on South Blvd. in Charlotte. Lorraine showered and dressed, carefully donning her “uniform”: tailored black linen trousers, Donna Karan starched white cotton shirt with collar flipped up, Eileen Fisher flowing linen sweater, black Donald Pliner flats, pearls, and diamond earrings. Then she applied her make-up and fluffed up her wild black hair. She made a kissy noise and Suki came running, jumping and spinning in the air, her pink leash in her mouth. “OK, Suki Darling. Let’s go outside now,” Lorraine directed. She clipped the leash onto Suki’s pink velvet collar, careful to avoid snagging the dog’s silver charm necklace, and the two of them stepped out onto the front porch of 44 Cherry Street. As it was ten AM, the street was beginning to wake up. A few of the stores were opening: Mountain Nest’s door was open and Colleen was sweeping the front sidewalk. Wonderful smells were emanating from Dark City Deli. Jen must have been preparing her famous Buffalo wings and pre-grilling some chicken breasts. Lorraine’s mouth watered. That cardboard-cracker and sliver of cheese she had eaten earlier had not filled her up at all. She must resist, though! She descended the steps, paused while Suki relieved herself on the grass, and turned up Cherry Street towards State Street, passing Art from the Heart and Periwinkle’s. City workers drove by, collecting bags of trash so Cherry St would be tidy for the arrival of tourists. A Black Mt policeman shook his finger at a merchant unloading merchandise, her car parked heading the wrong way, the rear end protruding into the road. “I could give you three tickets right now, “he called to her. Lorraine, her heart fluttering, encouraged Suki along, not noticing the buttered bagel in the dog’s mouth, found beneath one of the knitter’s rocking chairs. “I’ll just carry this treat on home and snack on it later,” thought Suki. Just as he was about to place his order, a skinny middle-aged woman with a diamond ring the size of Texas, grabbed Mr. Right’s arm and smiled up at him. “Just a black coffee, darling!” she chirped. She left the shop with her cardboard cup and a small bag, untied Suki, and sipping her hot coffee, led the dog down the alley towards Sutton Street, a small black cloud hovering over her head. She turned left and strolled along window shopping in Sutton St Antiques, and turning left onto Cherry St. Probably there were available men e-mailing her right this minute. She said good morning to Betsy at Faison O’Neill and approached Stephanie who had just wheeled her Chifferobe sign to the sidewalk. “Hey Lorraine! What’s new with you?” Stephanie asked. “Um….maybe. But don’t be disappointed if there has been no response. Sometimes these things take a little while,” Stephanie warned. It certainly would take Stephanie a little while to get a wink on Match The clothes she wears!! Is that a big white nightgown? And it wouldn’t hurt her to put on a little make-up! “MacBook, here I come!” she shouted to no one in particular.